The second installment in Rusted Iron Games’ Deadly Gardens-series clocks in at 5 pages, 1 page front cover, 1/2 page SRD, leaving us with 3.5 pages of content, so let’s take a look! We begin this supplement with supplemental alchemical items, the first of which renders plant creatures dormant for a time – nice one! Clearwater Drops can be used to purify water – I like those. I have gone on record time and again, stating that DR is overvalued in PFRPG – thus, the 40 gp Tough-skin Oil, which nets you DR 2/slashing for 10 minutes for 40 gp may be a powerful item which I’d personally price at twice or thrice that, depending on your campaign’s power-level, is still a nice notion – underpriced though it may be in my book. Finally, we get a fertilizer that nets a plant creature fast healing 2 for 10 minutes. On a nitpicky side, the wording here implies that it takes a different action to apply the Vita Grow fertilizer if you’re applying it not to yourself, but that’s just nitpicking – much like the fact that I would have enjoyed a guideline for what intelligence is required for plants to apply items to themselves – per default, I assume the trick-guidelines for Handle Animal, but a slight clarification would still have been nice. 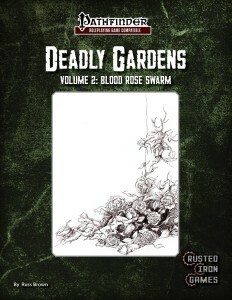 The Blood Rose Swarm itself comes with an impressive, hand-drawn b/w-artwork and clocks in as a CR 2 plant swarm. Blood Roses emit an alluring scent that can fascinate targets and their attacks carry with them a poisonous blood thinner. The swarm is also naturally camouflaged and may move faster through vegetation, offsetting the usual problem plant creatures have regarding mobility. It should be noted that the toxin is also depicted as a refined poison for your convenience. Now hereafter is easily my favorite section in this pdf – as much as I enjoyed the critter -we get rules for low level sinkholes and rockslides as hazards and no less than 5 different terrain types – from scree to kudzu and dense thickets, these can neatly enhance many an encounter beyond the scope of this pdf – neat! The final page covers two magical items, the first of which would be the Cloak of Fallen Leaves – made from autumnal leaves, it grants the wearer concealment versus AoOs incurred by movement, while Quickgrow Beans generate easily scalable beanstalks 40 ft. high – the spell duplicated by this Jack-inspired item has not been italicized. Editing and formatting, while not perfect, can still be considered good. Layout adheres to Rusted Iron Games’ two-column full-color standard and the piece of original artwork is sweet indeed for such an inexpensive pdf. The pdf comes sans bookmarks, but needs none at this length. Russ Brown’s second Deadly Garden is in many ways more experimental than the first – the creature is more complex and the items are a bit more far out. While personally, I bemoan the lack of power components herein, the hazards and terrain-types provided can be considered absolutely worthwhile – as far as supplemental material goes, this delivers more than its asking price. Indeed, at this point, I find myself intrigued regarding more installments in the series: There is quite some potential here, particularly for fans of the Witcher games and those of us that prefer a more down-to-earth, organic, low-magic type of gameplay. My final verdict, in spite of the minor rough edges, will, again, clock in at 5 stars + seal of approval – definitely a well-invested buck here! You can get this cool pdf for a single buck here on OBS and here on d20pfsrd.com’s shop!